The year rounded off with two events in December, there was traditional Carol Singing at the North Star on 17 December and a Christmas Hamper raffle raising the sum of £150 in total. The total amount raised in 2013 was £7,177.53 plus donations from my virgin giving website. Another very successful Charity dinner dance and auction was held at Brocket Golf Club “Memories are Made of This” – 56 people attended the charity dinner, auction and dance at Brocket Hall Golf Club to raise awareness and funds for Admiral Nurses by the support they provide to sufferers and carers of those with Dementia. A great time was had by all and we managed to raise £5,776.80 which is amost double that of 2013. A big thank you goes out to those who supported the event, by donating the venue, providing the music, their time, those who donated auction and raffle prizes and of course all those who attended. Charity lunch at the North Star PH, Welwyn AL6 0TA raised £320.04 – thanks to Margaret and Richard Harold for hosting the event, and all those who kindly donated raffle prizes. It was BIG lunch day and the community where I live decided to make Dementia UK their chosen charity this year and we managed to raise £150.59 for this very worthy cause. Thanks go to everyone who supported this initiative. Cheese and wine lunch at my pad in aid of Dementia Awareness week raised £156.00. Thank you to all those who came and those who didn’t but made generous donations. To mark “Time for a Cuppa” National Fundraising week for Dementia UK, we had a Ready Steady Cook challenge with two teams competing plus a demonstration of the products by the Pampered Chef Representative Amita Carr. We made an amazing £524 which is a great start to this year’s fundraising activities and includes generous donations from supporters not able to attend. My thanks go to Bunches Flowers who donated a beautiful bouquet of flowers for our raffle, Bellevue Tea for supplying the tea and to Tesco, Stevenage for providing the other refreshments needed to ensure that every penny made was donated to Dementia UK and of course to everyone who supported the event by attending and having fun. The year rounded off with two events in December, there was traditional Carol Singing at the North Star on 20 December and a Christmas Hamper raffle raising the sum of £272. The total amount raised in 2012 was £6835.79 plus £422.76 in donations. Thank you to everyone who has supported me and continues to support me for this very worthwhile cause. Afternoon Tea including home made cakes and scones at the North Star PH, Welwyn was a great success raising £376.65 – thank you to all those who supported it. 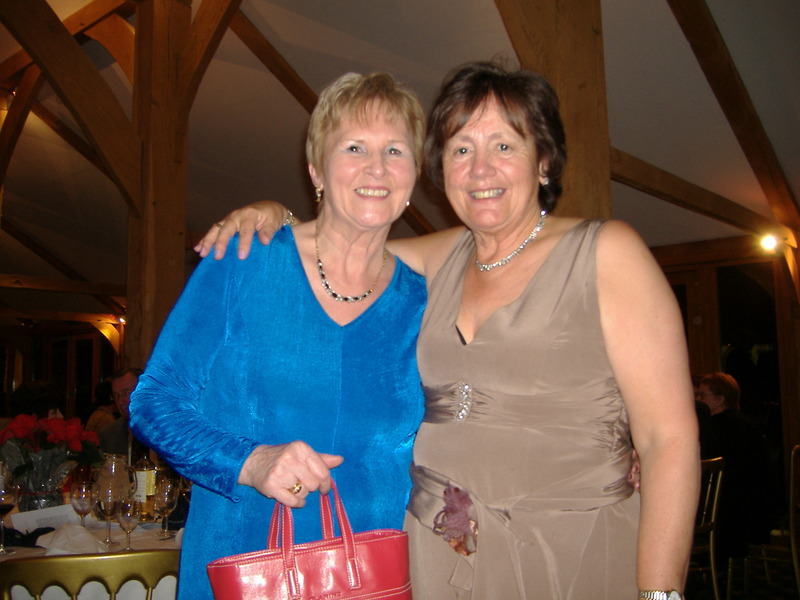 One Night One Place – 60 people attended the charity dinner, auction and dance at Brocket Hall Golf Club to raise awareness and funding to gain more support for sufferers and carers of those with Dementia. A great time was had by all and we managed to raise £3,650 which in the current economic climate was fantastic. Thanks to all those who supported the event, by donating the venue, their time, the auction and raffle prizes and of course those who attended. 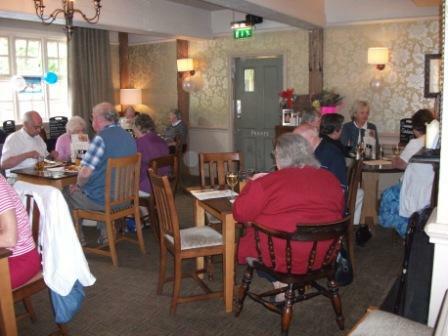 Charity Lunch & Raffle – 56 people attended a lunch at the North Star PH, Welwyn for an excellent two course lunch on 20 June. Due to the generosity of Margaret and Richard Harold, and all those who donated raffle prizes, we managed to raise an amazing £500. Thank you for everyone who showed their support. Grand National – as no-one had drawn the winning horse the £60 collected was donated to Dementia UK – thanks to all my friends for this generous gesture. Easter Egg Raffle – we had an Easter bunny donated to us and Lessiter’s the Chocolatier supplied us with an Easter Egg so we combined the two and had an Easter Egg raffle at the North Star PH and managed to raise £140. Thank you to all those who supported this event. 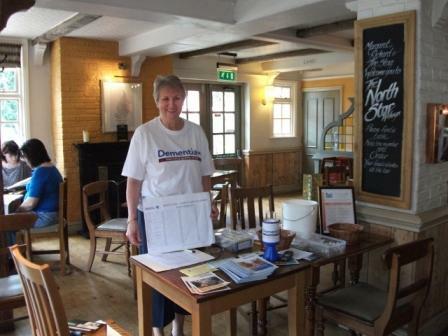 National Fundraising week for Dementia UK was a great success. 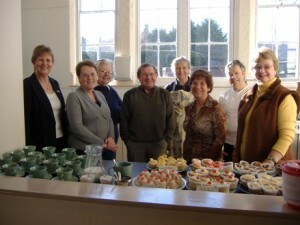 It commenced on 27 February 2012 with a coffee morning at the New Fellowship Hall in Whitwell and raised £298.46. On 28 February we held an Afternoon Tea at the North Star PH, Welwyn where we raised £300.50. This was followed on 29 February with a jacket potato lunch at the Glaxo Day Hospital, Stevenage raising £48.70. On 2 March, Whitwell Post Office entered a team into the Jubilee Challenge and they raised £125.00 which they donated to Dementia UK and finally, I cajoled all of my neighbours to donate to this very worthy cause by doing a house to house collection raising £102.56 making a grand total for the week of £875.22. Thank you to everyone who supported these various events. 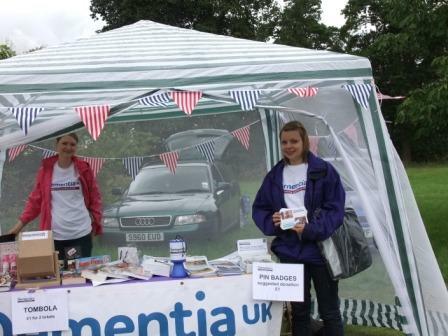 Despite the weather, we managed to have a great day raising an amazing £2,000 for Dementia UK. There was plenty of fun and entertainment and the old British Bull Dog spirit came to the fore with umbrellas going up and down like yo-yo’s but it still did not deter people from enjoying themselves. In support of Carer’s week, the North Star PH, Welwyn held lunch over two days to raise funds and awareness for Dementia UK. As well as having lunch, many of the local businesses supported the event by donating prizes for the raffle. The whole event raised a staggering £620 for this very worthy cause. 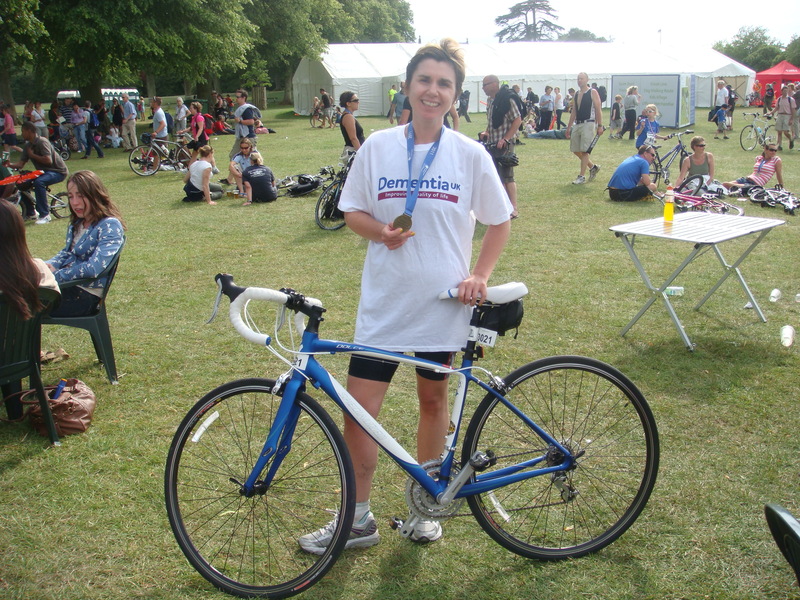 2011 Blenheim Triathlon – Well done to my sister-in-law Sian Phillips who completed her first triathlon. We managed to raise an amazing £1,355 but you can still donate by visiting her website on http://www.virginmoneygiving.com/SianPhillips. The quiz night held at the Glaxo Day Hospital on 18 May was very successful raising a fantastic £450 thanks to Rowe’s Fish & Chips who provided us with supper at very preferential prices and all of the people involved in the organisation and deliverance of such an enjoyable evening. Easter Egg raffle at the North Star PH – The Easter Egg was actually Sam the Shepherd made by Lessiters, Chocolatiers for 100 years this year based near Welwyn. This was a very succcessful event raising an amazing £220 – thanks go to Margaret and Richard and all the staff at the North Star PH for making this such a success and of course all those who participated. Time for a Cuppa – Dementia UK’s national fundraising day. We held the event in the Village Hall at Whitwell and due to the generosity of everyone supporting the event either by helping on the day or attending and having a “cuppa” we managed to raise £365 but with donations it was over £400. Events were also held at the Glaxo Day Hospital, Stevenage and Glaxo Smith Kline through the assistance of their catering Company Sodexho so our total will be about £700 when all the monies are in. I would like to thank Yorkshire Tea and Tesco for providing the liquid refreshments, those who provided the home made cakes to sell and Sue May for making the morning that little bit more interesting by selling her gifts and cards for the benefit of Dementia UK. My thanks to go to everyone for their help in support in helping me raise more money for this very worthy cause. 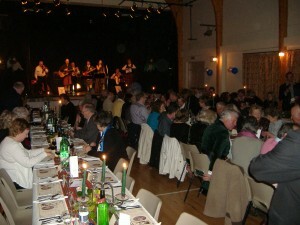 The Burns Supper kicked off my fundraising for 2011. A very BIG thank you go to Rick & Norma Fears who organised a Burns Supper to assist me in my fundraising campaign for Dementia UK. 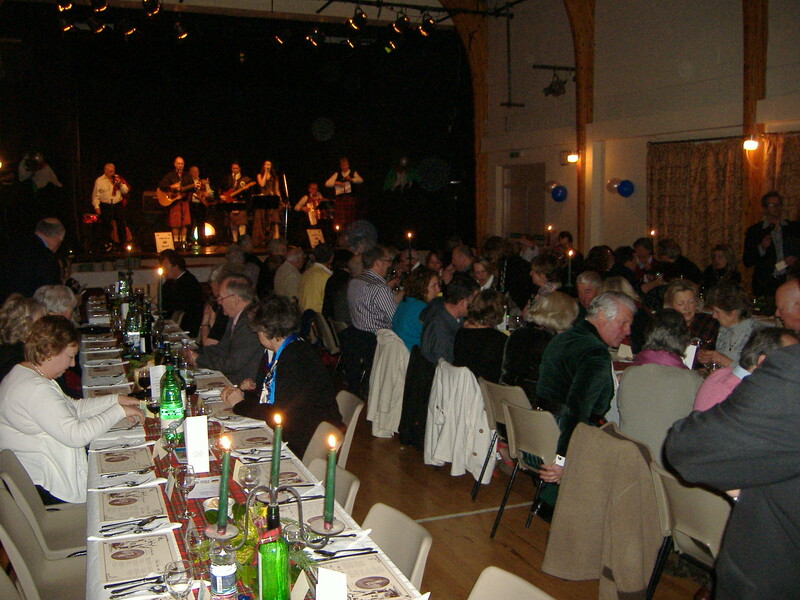 It was a fun packed evening with wonderful food and entertainment and raised an amazing £950. Elvis Rocks at the Brocket – A charity Dinner/Auction and dancing to Chris Smith an Elvis Tribute Artist in the Oak Room of Brocket Hall Golf Club, Lemsford, Hertfordshire was a fantastic success. Due to the generosity of so many people in donating auction prizes, raffle prizes, time and effort and of course supporting the event we managed to raise an incredible £9,000 for this very worthy cause. I would like to say a very BIG thank you to everyone for their support in making this event such an overwhelming success. 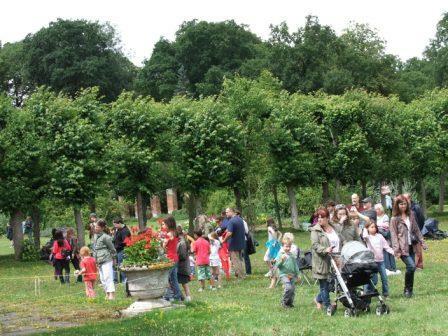 The first Bury Fun Day was held in the grounds of St Paul’s Walden Bury. Lady Bowes Lyon officially opened the event and two and a half year old Lily-Rose Chandler (daughter of Fay Mclean one of our Committee members) presented Caroline with a beautiful bouquet donated by Peony Florists in Codicote (see photograph). 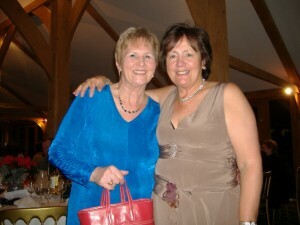 The other photograph is of Sue Hill from Dementia UK and myself at the Dementia UK stall. Amidst a week of showers, the sun shone for the event and a host of people enjoyed a variety of entertainment and activities including the Barking Mad Dog Show, the Bedford Buskers, the Busker Organ, the Bouncy Castle Kingdom, Pony rides, North Herts Sparklets Majorettes and an Indian Food Demonstration. There was also a huge selection of craft stalls. The event was well attended and many people took advantage of looking around the gardens of this beautiful home. I was delighted that the day was such an overwhelming success raising a fantastic sum of £4,200 and would like to thank everyone who volunteered to make it fun and enjoyable for every age group. Another opportunity was given to me to raise money for Dementia UK when members of the Garden Museum visited St Paul’s Waldenbury. I was asked if I could provide tea and biscuits to the visitors and thanks to the generosity of Caroline Bowes Lyon who donated their entrance money to the event an amazing £1,000 was raised. Our local postman, Rosey decides to run the marathon for Dementia UK as he feels as strongly as I do that more people need to be aware of the help and support that can be provided by an Admiral Nurse. Out of over 36000 runners only 3 ran for Dementia UK. The picture shows the St Paul’s Walden school joining in with their own mini marathon around the school field to raise funds in support of their postman and they raised £537.65 which I think was quite a shock to their parents and friends who had sponsored their run. Rosey ran in 5 hours 35 minutes 34 seconds raising a whopping £5,500 (including gift aided donations). Picture shows me and my very supportive friends providing tea and home made cakes in the Village Hall at Whitwell. It was a great success raising a total of £1,500.